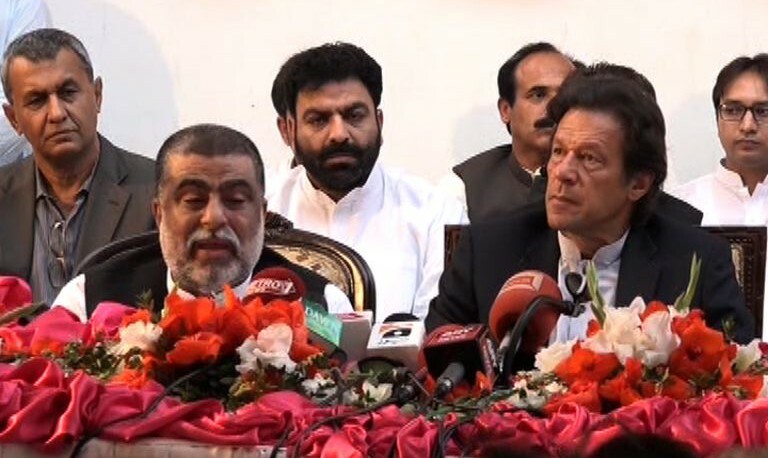 Imran Khan picked up another big name for his side recently with the announcement that Sardar Yar Muhammad Rind has joined PTI. This continues Kaptaan’s expanding his political reach beyond his home province. However, a closer look at the growth of PTI gives away the fact the party’s weakness, not its strength. PTI had branded itself as the party of change. Imran Khan’s “tsunami” was going to sweep out the old feudal elites and reinvent government with clean politicians serving the country’s interests and not their own. As the years moved on, though, the party remained a one man show where Imran Khan himself was the only candidate able to get any votes. This was when Imran decided to being about the first “change” as it was decided that the same old politicians that he had said were responsible for all of Pakistan’s problems could be cleaned with his blessing and join his party. Even Shah Mehmood Qureshi was given a seat next to Kaptaan himself. The “tsunami” of old political figures into PTI caused many to begin to lose “hope” in the party of “change”. Now that Yar Muhammad Rind has joined the party, all doubt should be swept clean. Yar Muhammad Rind is exactly the type of leader that Imran Khan has claimed to be fighting against since all this time. He has been arrested in connection with bombing cases such as landmine explosion in Dhadar area. He was sentenced to life in prison for kidnapping and ignoring the Court. None of that is important, though. What is important is that the feudal lord will bring countless votes to Imran Khan. Not because anyone actually supports PTI’s policies, but because they are required to through tribal loyalties. “My entire tribe will also join hands with Imran Khan when he visits Balochistan”, he asserted. It should be noted that Rind said this while sitting next to Imran Khan. His role of delivering votes as a feudal leader is no secret. It is the plan from beginning to end. This is what PTI has become. This entry was posted in Blogs and tagged imran khan, PTI, Yar Muhammad Rind by Omar Derawal. Bookmark the permalink.